Our Machine Operator bundle is tailored to your existing and new molding machine operators. The training lessons in this bundle take your employees through the basics of injection molding and then offer a little more advanced training for your operator level employees who show promise for advancement. All of your operators should take these lessons. Machine operators who are on the path to advancement will find the training in these lessons extremely valuable. They will learn the parts and operation of the molding machine and mold, the basic operation of the main machine controls and the basics of plastic materials and their flow behavior. This bundle prepares employees for The Molding Technician bundle. Graduates of this training are also ready for Paulson’s ProMolder™ 1 seminar through the Paulson Plastics Academy. When training new injection molding machine operators or standardizing training for your current operators, it is important to know what their current knowledge and skill levels are. That is what SkillCheck for machine operators does for you. Give your operators the assessment and you will know their areas of strength and weakness and have a baseline to measure their training progress. 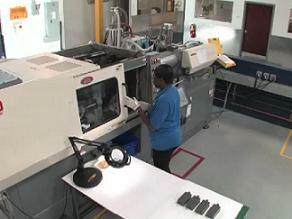 This course introduces new hires to the injection molding process. Some of the topics covered include basic operation of the injection molding machine and secondary equipment, safety on the injection molding production floor and around your molding machines, plus the fast and accurate identification of part defects . This course will teach your personnel production efficiency, safety and teamwork. Paulson partners with the industry’s leading providers of Health & Safety and Regulatory Compliance training. We can customize a package for you.